One Loaf of Potato Bread! Let's go make some fantastic potato bread! 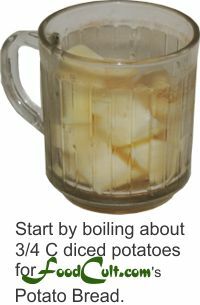 3/4 C warm water: warm potato water reserved from cooking potatoes + enough warm tapwater to make up a total of 3/4 C warm water. about 3 C white flour OR 2/3 C whole wheat (or less) flour plus 2 1/3 C white flour. Add 3/4 C warm water to the bowl. Sprinkle 2 tsp yeast over the water so each pellet gets wet. Once the yeast has become foamy mix it vigorously. Add mashed potato and mix in thoroughly. Add 2/3 C whole wheat flour OR if making pure white, 1 C white flour and beat well until the mixture is smooth. Add 1 C flour and mix well. Add 1/2 C flour and mix well (if too stiff for the spoon, work the dough by hand on a lightly floured surface). Add additional flour 1/4 C at a time (or less) just until the dough is silky and barely sticky (this dough can be a tiny bit sticky). Form dough into a flattish ball, lightly oil surfaces of dough, and return it to the bowl. Turn the dough onto a lightly floured surface, punch it down and knead it into a flat, oval sheet to remove air bubbles. Cover with a lint-free tea towel and let rest for 5 minutes. Remove the tea towel and knead into the desired loaf shape using the stretch-and-fold method. Place loaf in parchment lined, (or silicon or well oiled) pan and cover with a lint-free tea towel. Place in a warm, draft-free place to rise. Preheat your oven to 460o f (238o c) with the rack on the middle position. While oven is preheating you may slash or do an egg-wash on your loaf or simply let it continue to rise while the oven pre-heats. After this initial period, lower the temperature to 430o f (220o c), cover the loaf with a sheet of aluminum foil and bake for another 20 minutes. Check for doneness. Return to oven for a few minutes if not fully baked or move to wire rack to cool. 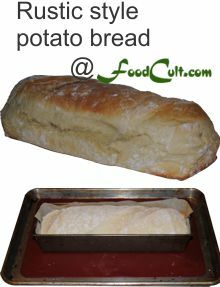 To create this rustic form, rise the dough and bake it in a parchment paper lined loaf pan on the baking sheet (as shown here. We use a silicon liner for the baking sheet.) Then, at 10 minutes, gently turn the loaf onto the baking sheet, remove the parchment paper and cover the loaf with aluminum foil, and return to the oven and the reduced temperature, to finish baking. NB The exact amount of flour cannot be predetermined as it is based on the amount of liquid. Mashed potato is a (thick) liquid and, so, varying factors dictate how much flour you must add. Add flour until almost all the stickiness is gone. This dough retains a little bit of stickiness before the first rise. Tap Test: The bottom of the loaf should sound hollow when tapped (when cooked). Return to oven if the bottom does not sound hollow when tapping. Cover your breads with foil earlier, during baking, to make a lighter crust. A potato ricer insures a more homgenous potato. This means it will mix into the dough more quickly AND more evenly! No, it's not Irish ... it's just a great, soft and moist bread! 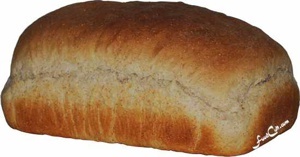 This variation is a common white bread. As with almost any bread, this one can be made as a formed loaf or rustic style. We like this loaf as a nice, wide, low-profile loaf and, so, use a broad, 9" x 5" (23 cm x 13 cm), parchment paper lined form. More traditional loaf size forms (ie, 8 (20) or 9" x 4" (23 cm x 10 cm) would yield the more common "brick with a voluptuous head" shape. Potato adds a uniquely moist texture to this loaf ... a characteristic not entirely common in other breads. In its addition, it must be smooth and lump-free. 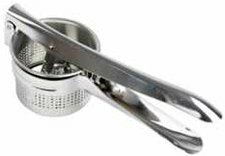 We recommend a potato ricer to insure creamy-smooth potatoes. The technique of adding a cup +/- of another grain may be adapted to this potato bread recipe causing a whole wheat variety or a light rye loaf to be more moist and soft than the more familiar, potato-free whole grain breads. There is little better than this bread for a club house sandwich or the classic BLT. This bread is also beautiful for grilled cheese ... or simply as a slice of toast dressed with your favourite bread garnish ... a wonderful jam, nut butter or just a bit of butter.